American Mystery Classics, 9781613161036, 312pp. Unoccupied and unsupervised while mother is working, the children of widowed crime writer Marion Carstairs find diversion wherever they can. So when the kids hear gunshots at the house next door, they jump at the chance to launch their own amateur investigation--and after all, why shouldn't they? They know everything the cops do about crime scenes, having read about them in mother's novels. They know what her literary detectives would do in such a situation, how they would interpret the clues and handle witnesses. Plus, if the children solve the puzzle before the cops, it will do wonders for the sales of mother's novels. But this crime scene isn't a game at all; the murder is real, and when its details prove more twisted than anything in mother's fiction, they'll have to enlist Marion's help to sort them out. Or is that just part of their plan to hook her up with the lead detective on the case? 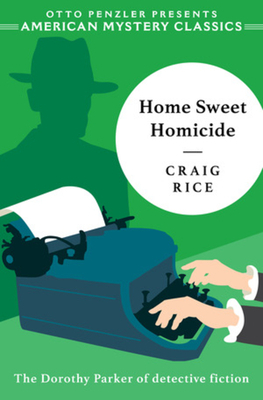 The basis for the 1946 film with the same name, Home Sweet Homicide is the novel that launched Craig Rice to literary fame. The book, a comedic crime story that pokes fun at the conventions of the genre, finds "the Dorothy Parker of detective fiction" at her most entertaining.